A spy probe recently took a few snapshots of the most protected hideout in the solar system. This base belongs to "Costi", the infamous leader of the pirates and is probably the most fierce-looking base known to date. Since the last time anyone attempted to take a "peek" at this hideout it would seem "Costi" has upgraded his HQ with technical equipment, the purpose of this upgrade remains unknown but word goes he's building a weapon, however that's no more than rumor probably spread by the pirates themselves to deter anyone from going to close to this base. 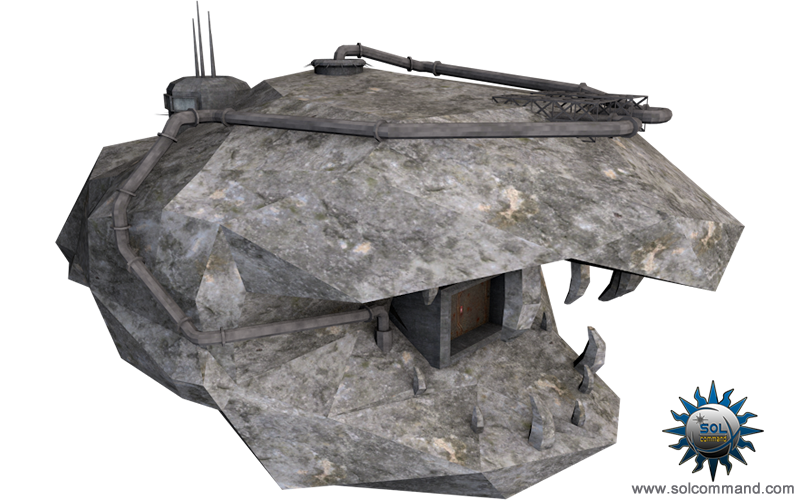 Previously known as "Adder", nowadays this asteroid has earned by word of mouth a new name, "Mal Hideout", "Mal" meaning "bad", most likely referring to it's predator-like look and feel and the fact that it's housing the most prominent figure of the pirate underworld. The station looks great in that asteroid field m8, nice work and thanks for letting me know.